One of my goals for 2012 is to make and use ingredients from scratch. First up: vanilla extract! This was my first time making my own vanilla extract, and I couldn't believe how easy it was! I gave away my first batch as gifts at Christmastime, but I just ordered more bottles to make some for myself. Split three vanilla beans lengthwise and place in a clean glass bottle or jar. Pour 8 ounces of alcohol over the beans. Seal the bottle tightly. Store in a dark, cool place for two months. Shake the bottle occasionally. After two months, your vanilla is ready! no way!! That is so cool Sherri! Love your ideas. So much fun and who doesn't love to have a pretty bottle to use when they're baking. Might have to try this for some b day presents. That is so funny - my mother-in-law gave me vanilla beans in my Christmas stocking to do this very thing! She has been doing it for years. I am so excited to try it. Isn't it awesome? and so cheap?? Is it really that simple?! I'm amazed! I've been meaning to make my own vanilla extract. Love the jars too! I am very impressed, and the little bottles and tags are adorable! Thanks for sharing this--I've been waiting :) I can't wait to make some soon! These are so great and I just LOVE the bottle you used too! Such a nice gift! Hmmm very interesting...I think I am going to have to try this! I'm sure it's better and probably less expensive than buying it! what a great idea! this would be such a cute party favor too! love how yours turned out! I've always wanted to do this! So cool. Wow! So awesome! I forget sometimes of thinks that could be made from scratch! Oh my word, so doing this!! I put vanilla extract in everything! wwo. this is totally badass. i wouldn't expect any less from you, though. Really? That's it? I should have been making this stuff years ago!! Awesome!! I'm looking forward to what else you'll be making from scratch! I've got to remember this for Christmas presents next year! I made these for Christmas! I actually waited too long to start the project so they weren't fully mature... but they were so cute and everyone was impressed! I love your labels! Awesome, thanks! This might be a dumb question, but does it turn out well? Do you notice a difference between store-bought? Yes, I can tell a difference between homemade and store-bought! 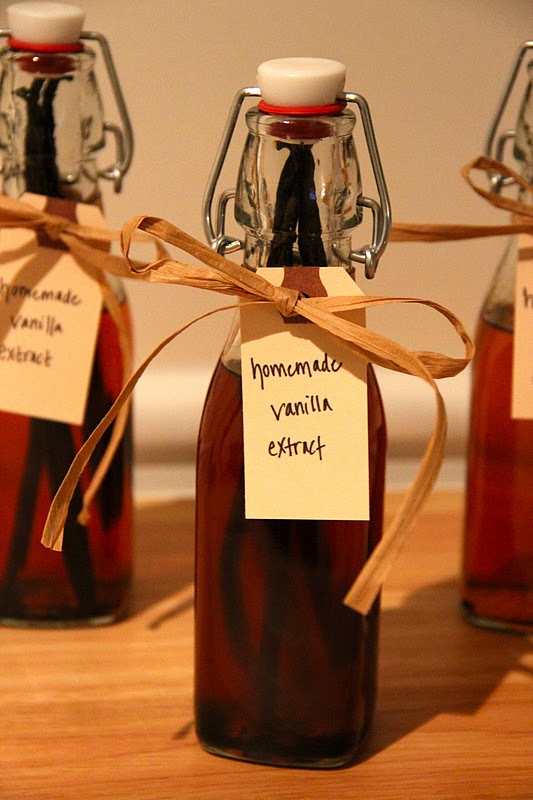 Homemade has a richer vanilla taste, and it's much more fragrant than store-bought.